He finished 12th in the league in assists (3.5/g), seventh in free-throw percentage (82.4 percent), sixth in three-pointers per game (2.4/g), 10th in assist-to-turnover ratio (1.2) and led the league by playing 36.7 minutes per game. He put himself among the conference elite in 2016-17, joining fellow All-OVC first-teamer Xavier Moon (Morehead State) and Newcomer of the Year Jonathan Stark (Murray State) as the only players to finish among the league’s top-12 in scoring, assists and made three-pointers per game. 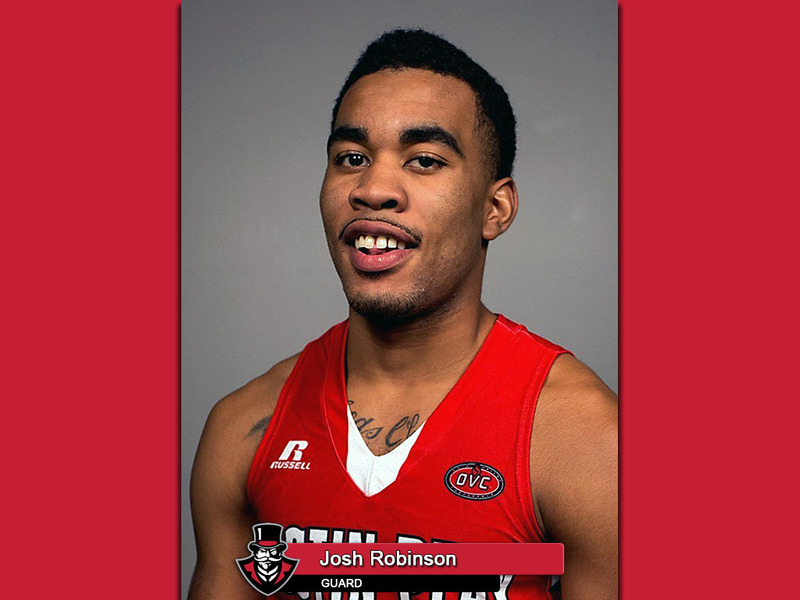 Nationally, Robinson is 29th in scoring, 13th in minutes per game, 243rd in assists per game, 128th in free-throw percentage, 111th in threes per game, 22nd in total points (590), 232nd in total assists (101), 64th in made field goals (187), 80th in three-point field goal attempts (194), 97th in three-pointers (71), 30th in field goal attempts (426), 34th in made free-throws (145), and 59th in free-throws attempted (176). Robinson hit a number of milestones during his junior campaign. He scored his 1,000th career point in the November 20th contest against Delaware—hitting the go-ahead shot with two seconds left in the process—becoming the 13th guard and 11th player since 2006 to reach that milestone. 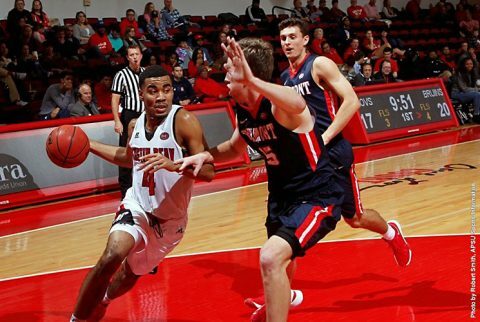 He earned not only All-Tournament honors at that weekend’s Tarkett Sports Classic, but picked up OVC Player of the Week, Tennessee Sports Writers Association Player of the Week and College Sports Madness Player of the Week; he also earned conference Player of the Week honors for the week of January 16th. On a single-game basis, Robinson’s standout performances included a 31-point effort and as season-high six three-pointers against Northern Kentucky (November 18th); 33 points against Fort Wayne (November 30th); 26 points, six assists and five threes at Western Kentucky (December 28th); and a conference-best 36 points a career-high tying seven rebounds against Eastern Illinois (January 14th). During conference play, Robinson ranked fifth in scoring (19.5 ppg), 14th in assists (3.1), 11th in free-throw percentage (82.1 percent), 10th in three-point field goal percentage (40.7), eighth in three-pointers made (2.3/g), 13th in assist-to-turnover ratio (1.2) and fourth in minutes played (36.5). Robinson’s 2016-17 campaign ranked 13th all-time in points (590), 14th in free-throws made (145) and attempted (176), 14th in three-point attempts (194), 15th in three-pointers (71), 22nd in field goals attempted (426), 29th in assists (101) and 34th in field goals (187). Entering his final season as a Gov, Robinson ranks 12th in scoring (1,494 points), fifth in three-pointers attempted (524), sixth in three-pointers made (187), seventh in free-throws (373), 10th in free-throws attempted (456), 13th in field goal attempts (1148), 17th in field goals (467) 18th in assists (214), 21st in minutes (2,936), 26th in games started (71), 28th in steals (85) and 34th in defensive rebounds (211). With Robinson snaring first-team All-OVC honors this season, it marks the first time since 2010-11 that the Govs have put players on the first-team in back-to-back seasons. He’s the first guard since TyShwan Edmondson (2010-11) to earn first-team honors and the first Governor since Wesley Channels (2009-10) to take All-OVC honors in back-to-back seasons.